Honey bees and native pollinators rely upon flowers to produce food for over-winter survival. The Arkansas Delta has a dependable fall nectar flow in most years from goldenrod, fall asters, and Pennsylvania smartweed. All wildflowers vary somewhat from year to year depending upon the weather. This year saw an abundance of fall asters but fewer stands of goldenrod and smartweed. 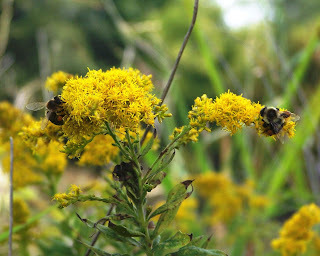 Today’s photo shows a honey bee and a bumblebee sharing the exposed goldenrod blossoms for pollen, which can be seen in the pollen baskets on the hind legs of both female bees. Both insects collect pollen for its protein, fats, vitamins, and minerals. However, the two bees use a different strategy to survive the dearth of flower food in the winter. The honey bee stays active throughout the winter and lives in a colony that is large enough to generate warmth. The bumble bee, which lives in much smaller colonies, produces a number of male reproductive bees late in the summer. The majority of the bumble bees die before winter; a reproductive queen survives the winter by hibernating in a protected area to start a new colony the next spring. Both bees mix nectar, a source of carbohydrate, with pollen to produce a complete food. The honey bees store the resulting “bee bread” in hive cells to feed to their brood. Honey bees store fat in body tissues to use to produce food for the next year’s first brood. Bumble bee queens feed heavily to store fat to nourish the queen during her winter hibernation. Fall asters and goldenrod are members of the important family of bee plants, the composites or sunflowers. The composite flowers are prolific producers of nectar and pollen. Pennsylvania smartweed is a member of the buckwheat family. As beekeepers use blogs to share ideas around the world, Tonmoy Roy, invites us to view his agricultural blog, http://royfarm.blogspot.com/, and see farming in Bangladesh. Along with poultry, fish, dairy cattle, sheep, and goats, they even tend to crocodiles! Thanksgiving is a seasonal holiday principally observed in the United States and Canada. The tradition of recognizing the bounty of harvested crops and reflecting on family, friendships, and bonds between neighbors is traced to gatherings of Native Americans and Colonists that took place in New England in the early 1600s. With European farmland becoming less capable of feeding the expanding population, colonists crossed the Atlantic Ocean, largely, to settle the New World’s ample farmland. However, many colonists encountered extreme hardships in their first years in the new land. For many, survival depended upon the assistance Native Americans provided in teaching the colonists how to hunt, plant crops, and harvest native foods. Pilgrims celebrated their first harvest with a feast at Plymouth, Massachusetts in 1621, and Puritans in the Massachusetts Bay Colony held their first Thanksgiving celebration in 1630. Large amounts of game, fish, and harvested crops were served. The Europeans especially enjoyed the wild turkeys of the New World, and they introduced them to Europe. Today, domesticated turkeys are the foundation of most Thanksgiving Day dinners. European colonists impacted the New World environment and agriculture when they brought in Old World plants, cattle, hogs, earthworms, and honey bees. Thanksgiving is a reminder to us of how important, and sometimes fragile, is our food supply. In the 1600s, people left Europe to seek new, fertile lands to produce food. Today, we feed the world, in large part, by industrial agriculture. Hopefully, we can balance the need to produce large volumes of food while protecting the soil, air, and water. People today have the same needs as our colonial ancestors: protection from the elements, food, and an environment free of toxins. Our bees, likewise, have the same requirements. We met many people at farmers markets this week gathering food for a traditional Thanksgiving feast. Among them was our friend, beekeeper and urban farmer, Mary Phillips. This Thanksgiving Day I am enriched by beekeeping friends from across the country and around the world. 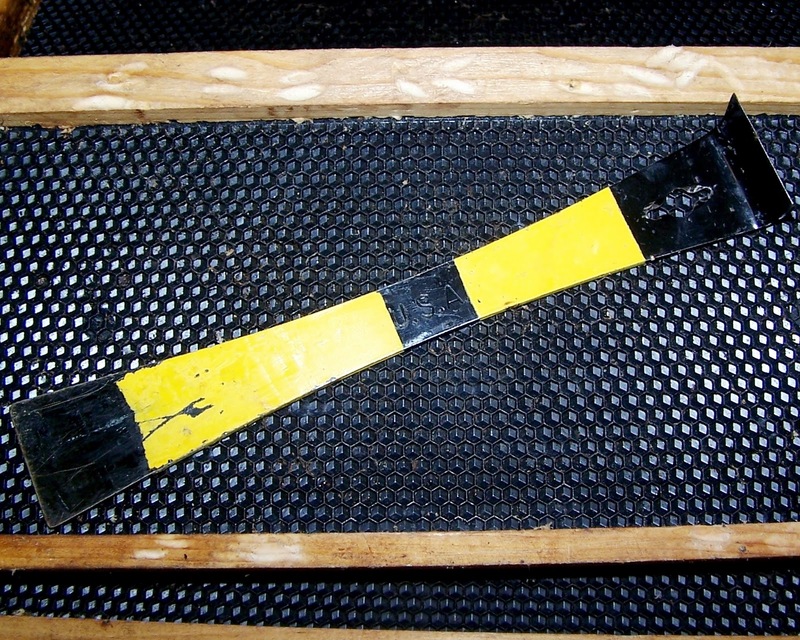 Some beekeepers say that their greatest beekeeping asset is their frames of drawn comb. It takes considerable time and resources of carbohydrates for the bees to produce honeycomb. The comb is produced by young bees that secrete beeswax from glands on the lower side of their abdomen. To produce beeswax, the bees must consume a large volume of honey. To make an ounce of beeswax, the bees eat about a pound of honey. Teams of worker bees take the flakes of fresh beeswax and build honeycomb while forming bridges with their bodies across open spaces in the hive, an act called festooning. Using their mouthparts, the bees shape the flakes of beeswax into sheets of six-sided, back-to-back cells. Beekeepers typically place foundation, either formed from beeswax or plastic, in frames to serve as the mid-rib for the bees to build their honeycomb. Depending upon the population of bees and the strength of the nectar flow, it may take the bees an entire year to draw out their honeycombs. 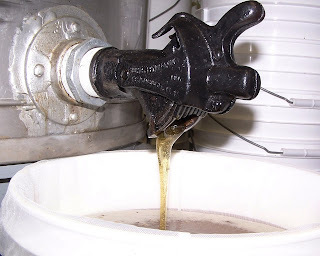 The beekeeper may aid the bees by feeding syrup as a supplementary carbohydrate. Once the bees have drawn the beeswax into honeycomb, they are ready to fill it with honey. After the beekeeper harvests the surplus honey, the frames need to be cleaned of any residue of honey and then stored over winter so that the bees can fill the comb with honey the following year. If the supers of “wet” frames are stacked outdoors, honey bees in the area will remove all traces of honey and take it back to their hives. The supers can then be stored over winter. Stacking clean supers so that air flows through them usually prevents wax moth damage if the frames never held brood. 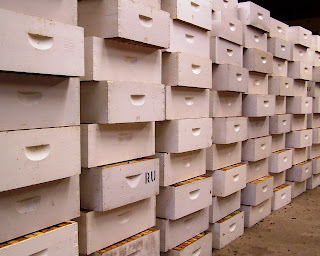 If frames that held brood need to be stored, they need to be protected from wax moths by stacking tightly and covering. Use PDB moth crystals to kill wax moths. Today’s photo: supers stored to allow air to flow through the frames. 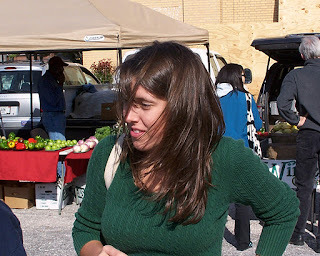 Farmers markets change throughout the year. 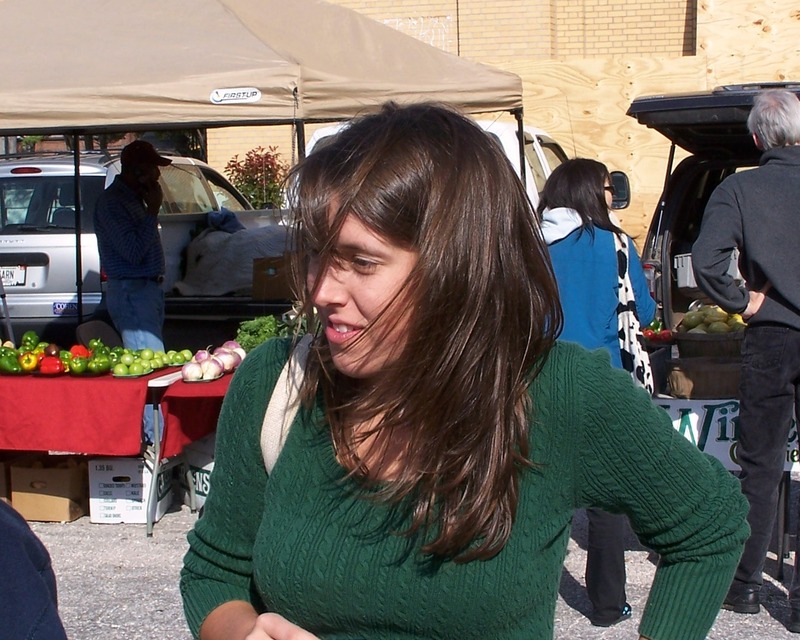 As the Mid-South’s seasons change from the often oppressive hot and humid summer to a cool and crisp fall, area farmers converge on parking lots and convert them into tent-covered markets. Farmers markets attract large crowds of citizens browsing fresh fruit, vegetables, baked goods, canned foods, jams, jellies, nuts, mushrooms, fresh meats, cheeses, eggs, locally roasted coffees, potted plants, cut flowers, and handmade items. 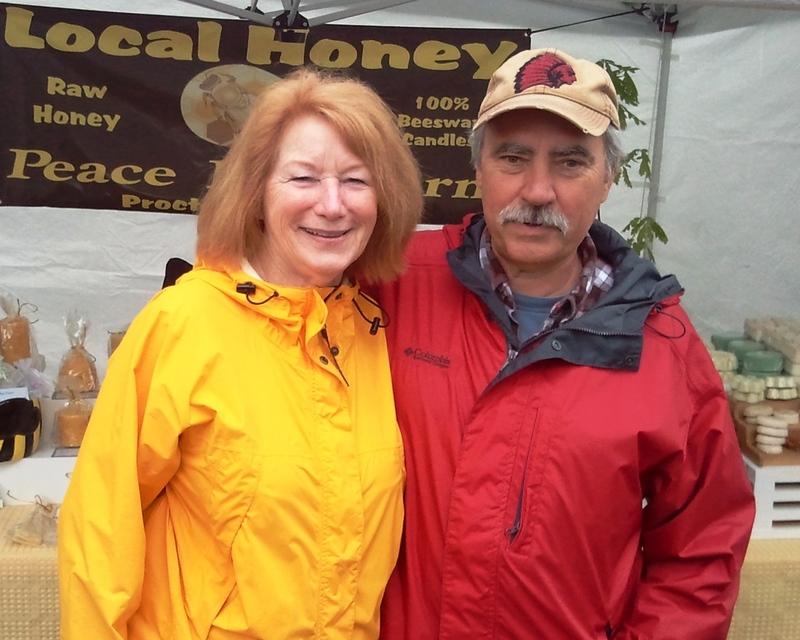 Peace bee farm sells honey and bee hive products at farmers markets. The markets provide a variety of goods not often found in a single location. For many, the freshness and quality of items produced on local farms makes farmers markets attractive. Fresh fruit and vegetables are usually harvested the afternoon before the market. Farmers often bring to market produce varieties that are not regularly found in grocery stores. Cool season greens are in abundance at the farmers market. At this week’s market, I counted a dozen varieties of greens and eight varieties of lettuce being offered. 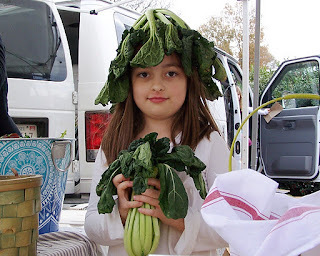 In today’s photo, Hattie displays the proper way to wear Yukina Savoy, an Asian green, while her mother, Lori, sells beets, turnips, onions, radishes, sweet potatoes, yams, potatoes, peppers, cabbage, bok choy, mustard, Swiss chard, lettuce, and mixed greens from Downing Hollow Farms. Memphis’ Cooper-Young Community Farmers Market, http://www.cycfarmersmarket.org/, invites area farmers to bring their produce; and they also provide a place for urban farms and non-profit groups to sell produce grown on vacant city lots and goods produced by groups like the Boys & Girls Club of Greater Memphis. The club’s young culinary students prepare local sweet potato pecan cheesecake, pumpkin ginger walnut cheesecake, red velvet cookies, and pumpkin cookies. The market uses grants to help double the spending power for citizens eligible to participate in nutritional assistance programs. We look forward to the interaction between farmers and the public all year long. The public notices the market’s seasonal change from tomatoes and sweet corn to greens and sweet potatoes. The honey bees’ nest is built of beeswax honeycomb that the bees secrete and shape themselves. It is light in weight and durable. However, honeycomb can easily be damaged by hive intruders, like mice or small hive beetle larvae. The beeswax comb also absorbs and holds environmental chemicals, like miticides, insecticides, herbicides, and fungicides. Honeycomb also holds reproductive spores of a number of honey bee pathogens, namely American foulbrood, chalkbrood, and Nosema, a honey bee gut disease. Honeycomb should be replaced periodically to remove toxic chemicals and disease spores from the hive. 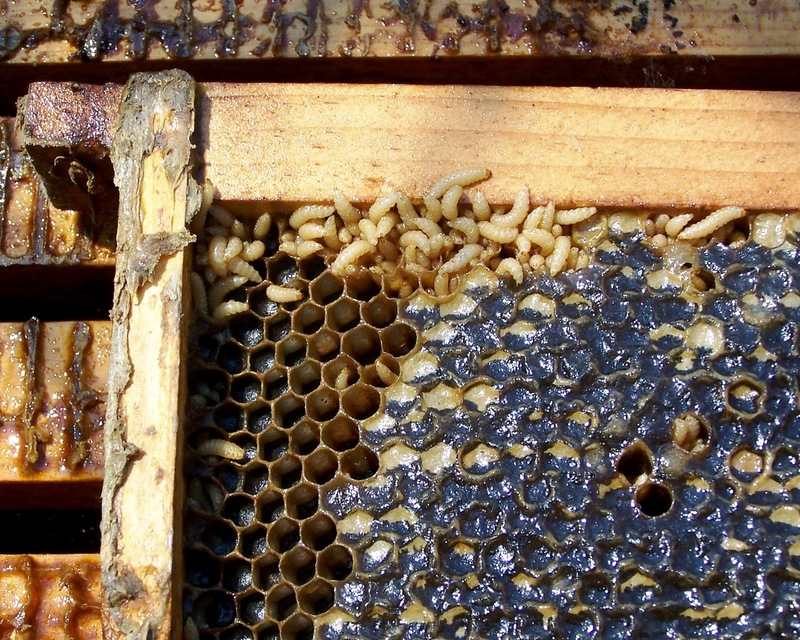 Frames of comb should also be replaced when they are damaged, like when the comb has been devoured by small hive beetle larvae. Bee hive frames are equipped with a foundation of either natural beeswax or plastic that forms the centerline of the honeycomb. If beeswax foundation is used, new foundation must be installed when the comb is replaced; however, if plastic foundation is used, it may be reused when the comb is replaced. The old comb is simply scraped away revealing the plastic foundation as in today’s photo of frames scraped to the foundation. These frames from the hive of a dead bee colony were “slimed” by small hive beetle larvae and covered by a mass of webbing of wax moths. After scraping the debris from the foundation, the frames were rinsed in water and dried in the sun. The wooden frames show the telltale markings of wax moths: dents in the wood where the pupae develop, giving the frame a hammered appearance. Actually, the wax moths helped remove the majority of the old comb from the frames. To make the bare plastic foundation attractive to the bees when these frames are reused, I will paint the surface with melted, chemical-free beeswax that I collected from our hives while harvesting surplus honey. Replacing old comb is an important piece of Peace Bee Farm’s integrated pest management plan. It removes disease spores and toxic chemicals from the hive. The small hive beetle is a hive scavenger that can cause severe damage to the bee hive and even drive the bees away from their nest. The greatest damage is caused by the larval stage of development of small hive beetles. The larvae consume great amounts of the bee hive to support their rapid growth. They are particularly attracted to sources of protein in the form of stored pollen, bee bread, brood, and drowned bees in hive feeders. Adult small hive beetles do little harm to the hive, but the colony employs guard bees to corral beetles freely moving about the hive. These bees occupied harnessing adult small hive beetles are taken away from other important duties, like foraging for nectar and pollen. Small hive beetles may be found in any hive. Adult beetles often congregate in a strong hive. Though the beetles are harassed by guard bees, the well-populated hive offers a favorable environment with warmth and plenty of food. Small hive beetles are keenly sensitive to honey bee alarm pheromones released by a colony in stress. The stress may be caused by queenlessness, attack by predators, or careless beekeeper activity. Once the beetles detect a bee colony is in trouble, they fly to its hive and immediately begin laying eggs. In just a few days, small hive beetle larvae can virtually explode in the weakened hive. 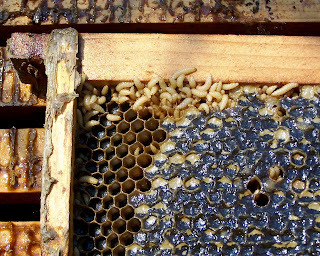 That is the case with today’s photo of small hive beetle larvae in a “slimed” bee hive. As the beetle larvae crawl through the hive, they consume everything—beeswax, comb, honey, pollen, bee bread, and brood. The ravenous larvae leave behind a liquid waste that supports the growth of yeast. Slimed frames have a strong odor of fermenting oranges. The odor attracts other small hive beetles from great distances while it repels the hive’s bees. Often the first indications of a small hive beetle infestation are liquid drooling from the hive, a sticky landing board, and the odor of fermenting oranges. If a colony is queenless in the fall, it will be dead by the following spring. As beekeepers prepare their hives for winter, they need to determine which colonies stand a chance of surviving the winter. Each hive should be inspected to see if its colony has enough bees to generate heat to stay alive throughout the winter. Any hive that is extremely weak needs to be combined with a strong hive. You can usually combine a weak hive with a stronger hive by simply smoking both hives to cover the bees' scents. If you are combining two fairly strong hives, you need to separate them with a sheet of newspaper to slow the mixing of bees to keep from fighting. If each hive being combined has a queen, the weaker queen can be removed. If you don’t remove one, the queens will fight and only one will survive. To survive the winter, the bees need to have two things: adequate hive ventilation and enough food stored in a location where the winter cluster of bees can access it. This usually means that the honey stores need to be above the brood nest. I like to rearrange the boxes so that the brood nest is at the bottom of the hive and the honey is above it. The winter cluster of bees will eat the honey above it and move up slowly throughout the winter. The cluster of bees will occupy the honeycomb emptied of stored honey. If a hive doesn’t have adequate honey stores, it is necessary to feed the bees. Fumagillin added to the sugar syrup feed helps control Nosema disease. Ventilation at the top of the hive prevents condensation and moisture build-up. Today’s photo: Judith Rutschman and Richard Underhill. Judith hosts the Memphis television program, Nature of Conservation. Judith interviewed me on the air about honey bee health matters, the effect of chemicals in the environment on bees, and the role of bees in human food production. Honey is harvested as the bees make it, one drop at a time. To make a tablespoon of honey to pour over a hot buttered biscuit requires the full life’s work of 32 honey bees. Producing a jar of honey is the result of considerable effort by both the bees and their keeper. Unfortunately, there are those who take advantage of the appeal, reputation, and health benefits of honey to unscrupulously produce a lesser product and sell it as honey. They do this by adulterating the product by mixing in cheaper sweeteners or by altering the honey to hide its true origin. In Andrew Schneider’s Food Safety News report, “Tests Show Most Store Honey Isn’t Honey: Ultra-filtering Removes Pollen, Hides Honey Origins,” the investigator writes that pollen is being removed from honey to hide whether the honey came from legitimate and safe sources. Honey is being produced in distant lands, shipped to intermediate countries, repackaged, and stripped of pollen to hide the true origin. According to Schneider, “Food scientists and honey specialists say pollen is the only foolproof fingerprint to a honey’s source.” Schneider explains that in the US the Food and Drug Administration says that a product that has been ultra-filtered and contains no pollen is not honey. One major honey packer describes ultra-filtration as “a deceptive, illegal, unethical practice.” Unfortunately, the FDA isn’t checking honey to see if it contains pollen. Food Safety News purchased honey and had it tested for pollen. They found that three fourths of honey purchased at groceries or big box stores and all honey purchased at drug stores contained no pollen. All honey purchased at farmers markets and “natural” stores, however, contained the expected pollen. Read this informative report at http://www.foodsafetynews.com/2011/11/tests-show-most-store-honey-isnt-honey/. In today’s photo, honey from late summer wildflowers and Arkansas Delta cotton flows in the Peace Bee Farm honey house. We appreciate those loyal customers who support the beekeeping tradition of producing real honey as the bees made it. At the time of the year when most beekeepers have completed their honey harvest and migratory bee hives are stationed for the winter, many state beekeeping associations hold their annual conferences. Rita and I attended the state-wide meetings for Arkansas and Tennessee, two states where we maintain bees. The meetings always afford an opportunity to renew acquaintances with beekeeping friends and to keep abreast of matters involving the beekeeping industry. But most importantly, conferences provide educational programs that put beekeepers in touch with beekeeping experts and researchers studying today’s honey bee health issues. Often I leave these meetings armed with more information but overwhelmed by the growing number of pests and pathogens attacking honey bees. However, I left this year’s events encouraged by details of recent studies and by reports of the resiliency of honey bees. Analysis of stored bee hive pollen and beeswax reveal the bees live in an environment filled with chemicals. Peace Bee Farm participated in several of these studies by sampling bees and comb. Honey bees in the US are exposed to numerous bee diseases. 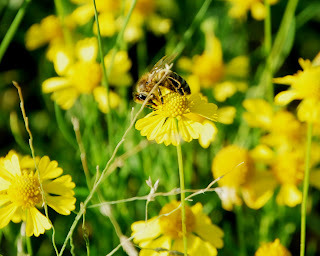 Honey bees in South Africa, by contrast, are exposed to more predators; however, they are affected by fewer diseases. When parasitic mites decimated honey bee colonies in the US, beekeepers responded by treating the hives with miticides. The mites rapidly became resistant to the chemicals. Varroa mites were identified in South Africa in 1997. Chemical controls were not employed, and within seven years the mites were reduced to an incidental pest. Many beekeepers in the US are moving toward reduced reliance on chemical treatments. The analysis of chemicals in honeycombs reveals that legal miticides become highly toxic to honey bees when they are present with other commonly used chemicals. For example, fluvalinate becomes 1000 times more toxic to honey bees exposed to fungicides regularly used on cropland, orchards, and home gardens. Beekeepers are learning to avoid the harsh miticides. We must use chemicals sparingly. Today’s photo: bitterweed, a common fall wildflower. Bees need the same basic things that humans need: a place to live, food, and an environment free of poisons. 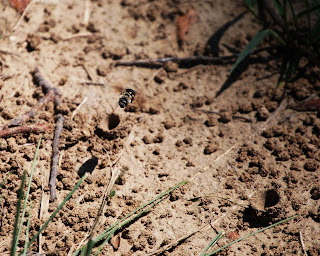 Many of the important native pollinators nest underground. Among these are bumblebees and numerous solitary bees. These bees prefer to enter the soil in bare areas not covered by grass, foliage, or mulch. One reason many native pollinators are declining is that favorable habitat is becoming increasingly scarce. Modern large-scale agricultural fields are plowed leaving little undisturbed margin for ground nesting bees. Golf courses and home lawns likewise afford little bare ground when they are covered by a turf of grass. To improve the habitat for ground nesting bees which add much to the effectiveness of pollination of many crops some farms are incorporating strips of ground between crop plantings to accommodate the bees. Homeowners may provide habitat by clearing a portion of a garden or landscape planting of mulch and then leaving the ground bare and undisturbed. Bumblebees, like the one in today’s picture flying from her underground nest, often build dwellings in abandoned mouse holes. With a long tongue, bumblebees are effective pollinators of many crops, especially tomatoes and eggplants. While the decline in honey bee populations since the mid-1980s has been carefully tracked, the status of native bees and other pollinators has not been documented as closely. One large-scale effort to identify the location and population of native bees enlists thousands of citizens to become data-collecting scientists. The program, The Great Sunflower Project, involves observing bees that are attracted to a single variety of sunflower. People, young and old, plant Lemon Queen seeds; and when the plants grow and flower, they identify and count the bees that come to forage. To sign up to participate in the project or view this year’s results, go to http://www.greatsunflower.org/. The participating citizen scientists found a bee every 2.6 minutes, but 20 percent of gardens had no bees at all. The count is important for identifying areas having shortages of native pollinators.